I was going to write about the Commonwealth Games one year on but there was no shortage of those kind of features in the media. Instead, this is a ‘year and a bit’ story. What’s happened in that time? Lots. What’s changed? Not that much at the end of the day. But I think that makes the things that have that bit more important. I’ve lived in the East End of Glasgow for over a decade. To people outside the area, the East End probably evokes a few things. The first ones probably aren’t about Glasgow 2014 (usually that we’re all ‘deprived’ – not spelled with an ‘a’!). In amongst those somewhere there might be a wee memory of gold medals or sunny ceremonies. Not much more – not enough for the hundreds of millions spent on it – but the connection is there. People who saw the Games have a slightly different view of Glasgow in general and the East End in particular. 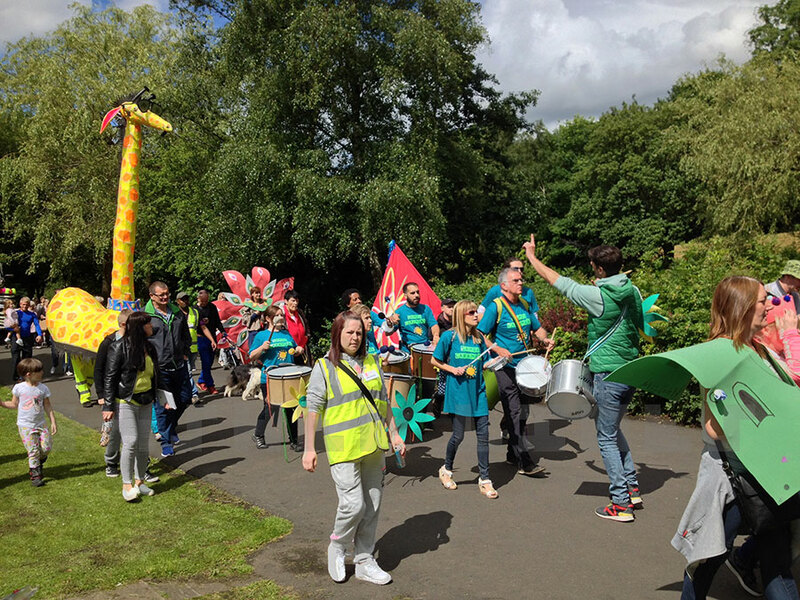 The city has been here before – previous Glasgow festivals have arguably had a bigger impact. The Glasgow Garden Festival in 1988, European City of Culture 1990 and, to a lesser extent, UK City of Architecture and Design 1999. However, those were mostly focussed on the city centre – I don’t think they had much effect on the East End. 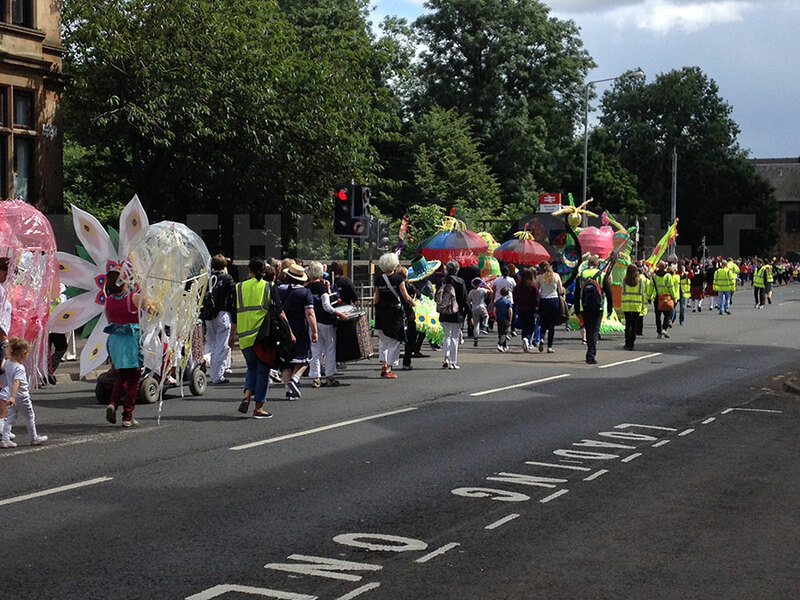 Culture 2014 was the ‘cultural programme’ ahead of and during the Games. There were all sorts of arts events but the musical ones made the biggest impression on me. Most people would’ve seen bands on the main stage at the free Festival 2014 in Glasgow Green. 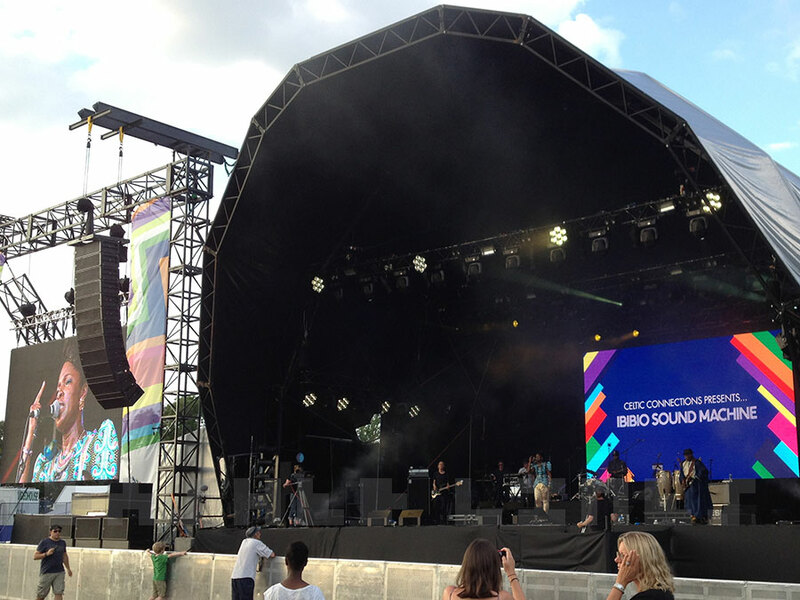 My favourite there was Ibibio Sound Machine. They went from getting a few people dancing to a full conga line. In between there was a great moment of two jaikie guys trying to impress some African girls with their dancing. I caught some of Harri & Domenic’s bill at the Barras/Sub Club (had a good excuse for missing the rest!). And I had a good day in Richmond Park at the Last Big Weekend. Indie nostalgia, future Mercury winners and West beer (once you stuck it out in the queue). The highlight for me was the earlier Duke Street Expo where bands played free gigs in local shops and public venues. These weren’t your average local bands – they were booked by Chemikal Underground, the indie record label based in Bridgeton. I went to the ‘pay in’ gigs in the churches too – Admiral Fallow and King Cranky, I mean Creosote (he ranted about how we didn’t need the Independence referendum – I think he was stressed about his ‘From Scotland with Love’ orchestra show). I have a really pure memory of dusk in Armadale Street church. Purple light from stained glass windows on white walls and the beautiful voice of Ella the Bird. It wasn’t just the gigs and venues, it was showing my area to a few friends and meeting new people at The Big Lunch earlier in the day. I had a wee reminder of that, one year on, from the North East Festival’s first leg at Alexandra Park. You heard them well before you saw them. The drummers from the marching band were first. 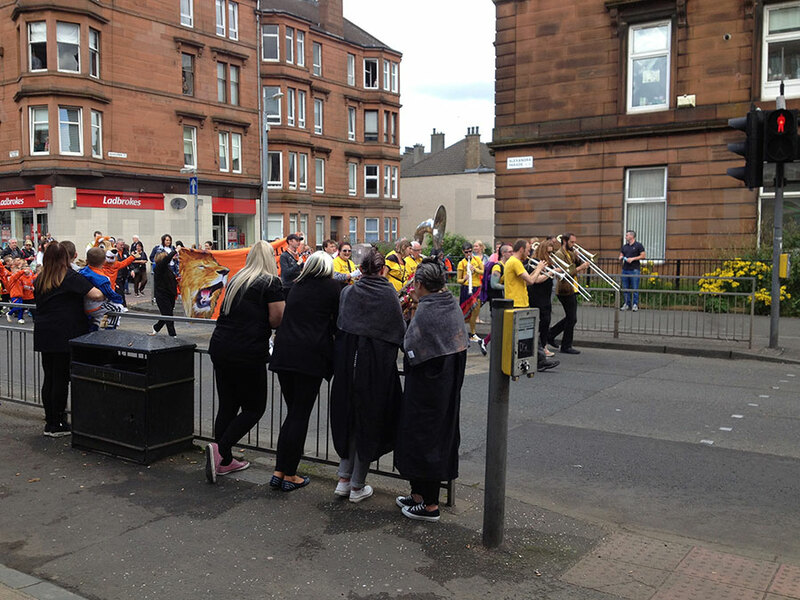 In Glasgow, that makes you wonder if you need to run to cross the road before the parade comes through. This march was a lot more laidback than most. 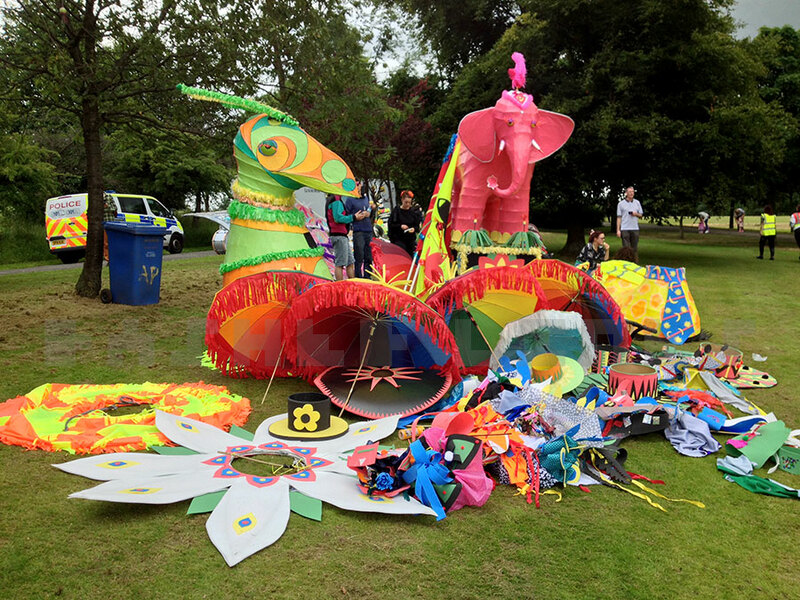 It was led by a pink elephant and psychedelic parrot for a start (yes, I was sober!). 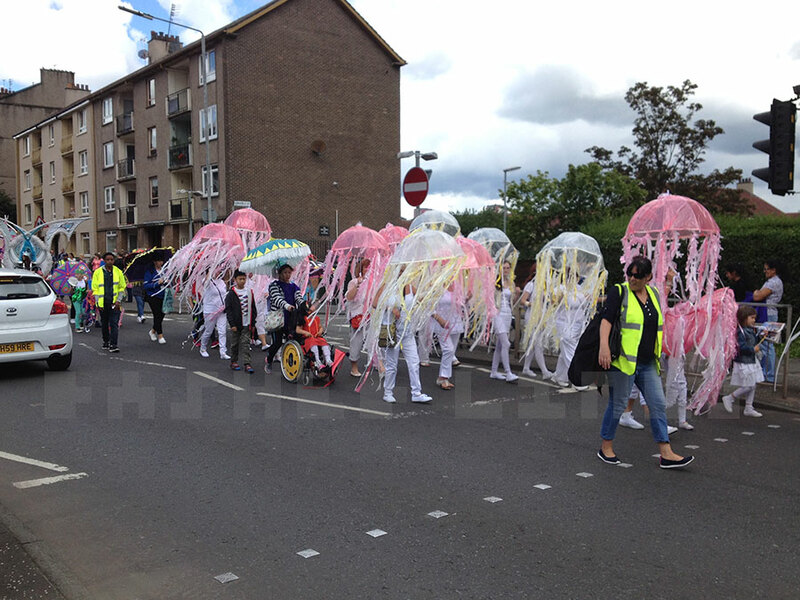 They were followed by Beat That drummers, parasol jellyfish, Brass Aye playing Funkadelic, carnival costumes, Samba Caramba, hordes of kids, a giraffe, a zebra and Mungo’s Hi-fi on wheels. Kudos to the people who think this stuff up. It must have taken ages to make all the costumes but it was worthwhile. It got half smiles from dour-looking old blokes. It had the women out the hairdressers still with the dye in. And it did the trick of leading folk to the park. The crowd had plenty of time to catch up with the leisurely pace along Alexandra Parade. Traffic was only stopped eastbound so it took a few goes to get everyone through the lights at the crossroads. When they stopped on the main path inside Alexandra Park they looked even more colourful. The marchers were on one side, the crowd on the other and the flower beds blooming in between. After turning the corner near the fountain, the first of the stalls started. 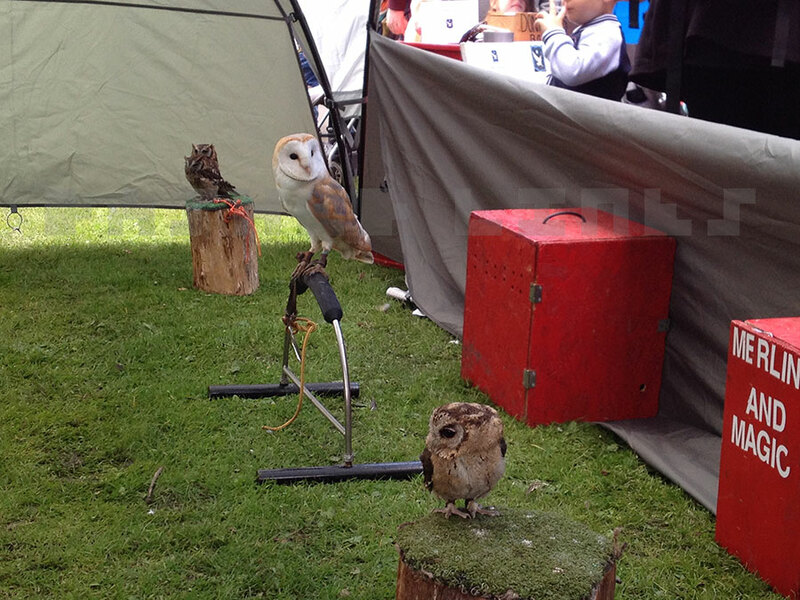 I was quite taken by the tent with the eagle and owls perched inside. I wondered why there seemed to be a wee mascot sitting amongst the real birds until it turned its head and I realised it was a tiny owl. I think Chris Packham’s job is probably safe! Further on there were a few sweetie stalls. Since I hadn’t had lunch, the smell of onions lured me to the burger van for a hot dog. Some of the local cafes would have made for a wider menu but I guess you’ve got to be practical about these things. 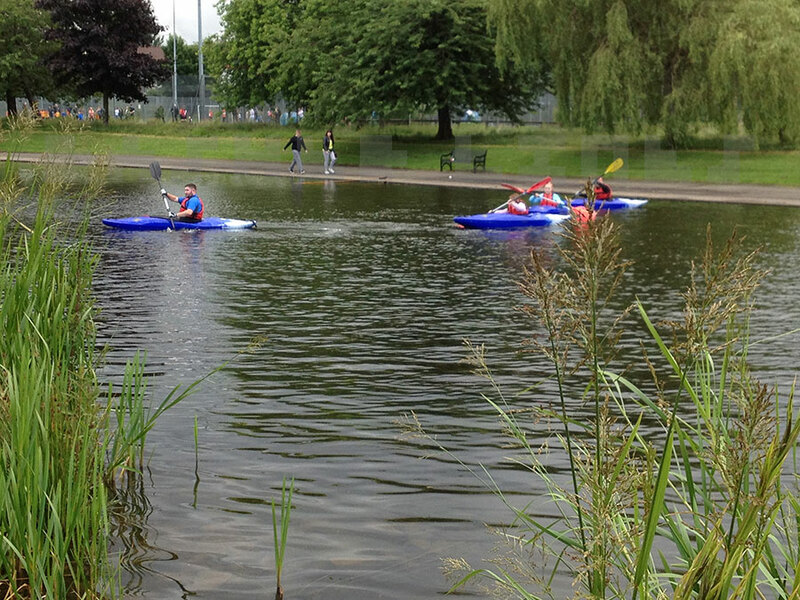 Part of the lake was being used to give kids a go at kayaking. Most needed the instructors to nudge them off the rope at some point but they seemed to get the hang of it. The field next to the water had various spinning, inflatable or elastic things for children to jump about on. They seemed pretty popular – I fancied a go on the bouncy castle myself but managed to resist. Further up was a wee stage with music from local acts. It was mainly cover versions but helped with the atmosphere. I came back down to stalls for local groups like Dennistoun Community Council. I’d met a few of the people at The Big Lunch in 2014 so I stopped to chat about the Friends of Alexandra Park group that was being set up. There was a boxing ring in the middle of the field which turned out to be for wrestling. By the time I came back round I didn’t have the best view but could still see the guys getting lifted up and definitely hear them crash onto the canvas. The crowd were getting quite into it even though the rain was starting to come and go. I decided it was time for me to head home; past Stan’s for a coffee on the way. 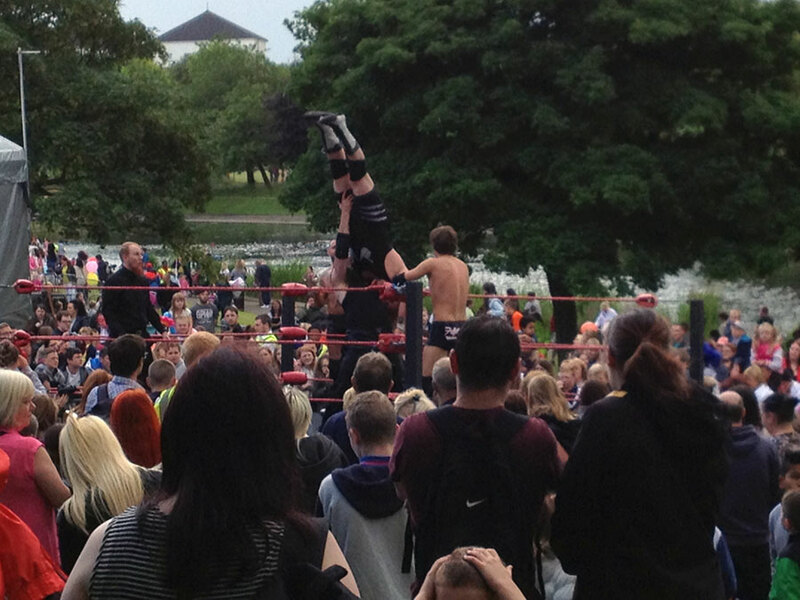 I wanted to write about these Glasgow festivals because I didn’t see them mentioned very much. 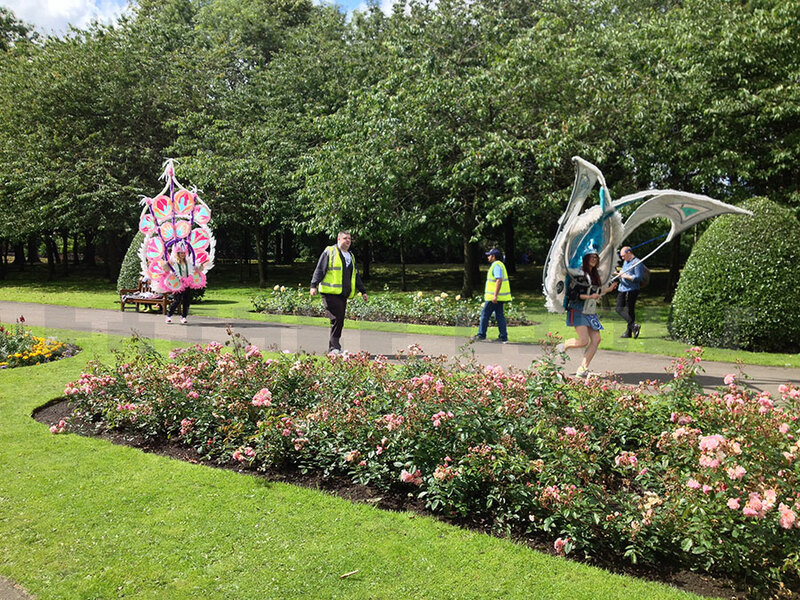 The West End Festival and Glasgow Mela get quite a lot of coverage so it might give the impression these things only happen in Kelvingrove Park. 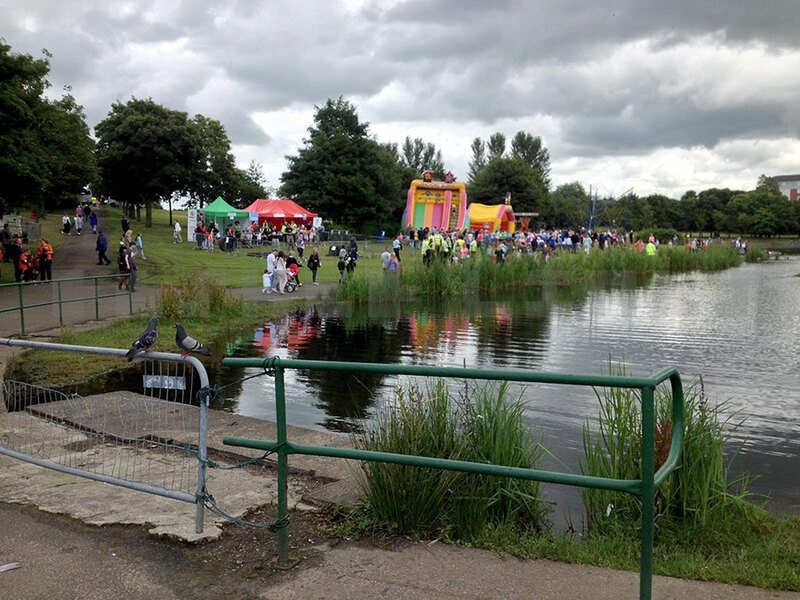 The North East Festival reminded me of local Gala Days from my childhood. I think they’re a bit harder to organise these days (maybe that’s why there are less of them?). The ones that are still going are worth celebrating. 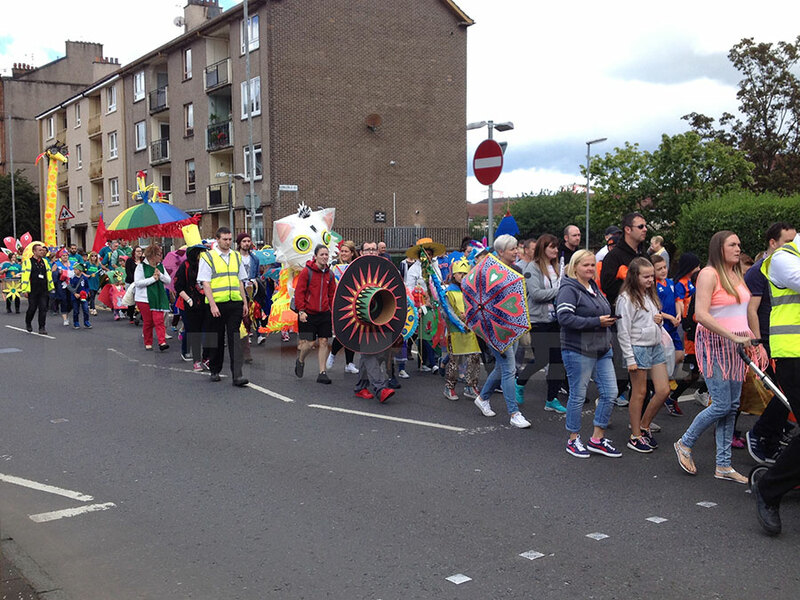 Also, in Glasgow, parades and festivals can be very partisan – often they end up being for one group or another. It’s good to have events that are open to everyone in the community.